On Monday at Eastern High School, senior Elizabeth Collins signed her National Letter of Intent to join the Siena Heights women’s basketball team next season. Sitting in the front row, from left, are Nancey Collins, John Collins, Elizabeth Collins and Melissa Collins. Standing in the back row are EHS assistant coach Jay Reynolds, former Lady Eagles assistant coach Tim Baum, Eastern head coach Jacob Parker, Lady Eagles assistant coach Brian Bowen, former EHS head coach John Burdette, and Eastern assistant coach Ashley Roush. TUPPERS PLAINS, Ohio — The goal was always there, now the destination is set. 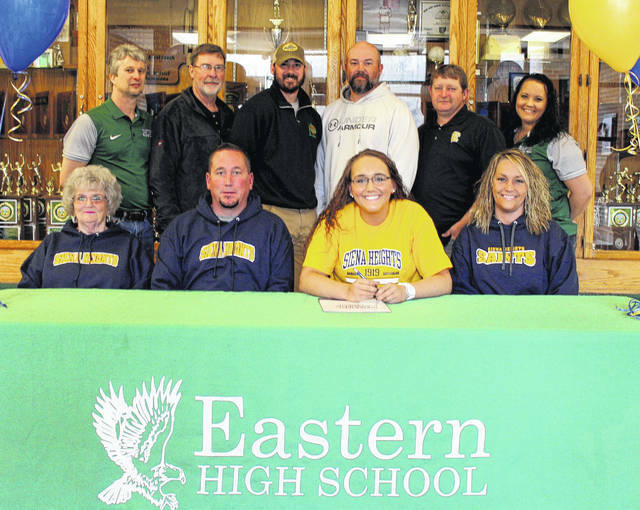 On Monday at Eastern High School, senior Elizabeth Collins signed her National Letter of Intent to join the Siena Heights women’s basketball team next season. In four seasons at Eastern, Collins has helped the Lady Eagles to a 72-26 record with four sectional titles and one district championship. After being coached by John Burdette in her first two seasons, Collins was been coached by Jacob Parker in her junior and senior campaigns. “She’s meant a great deal, she comes in and works hard every day,” Parker said. “She really stepped up this year as a senior, and took freshmen under her wing. She tried to show them the ropes and show them how to work hard. Of course, her scoring and rebounding was essential for our team. 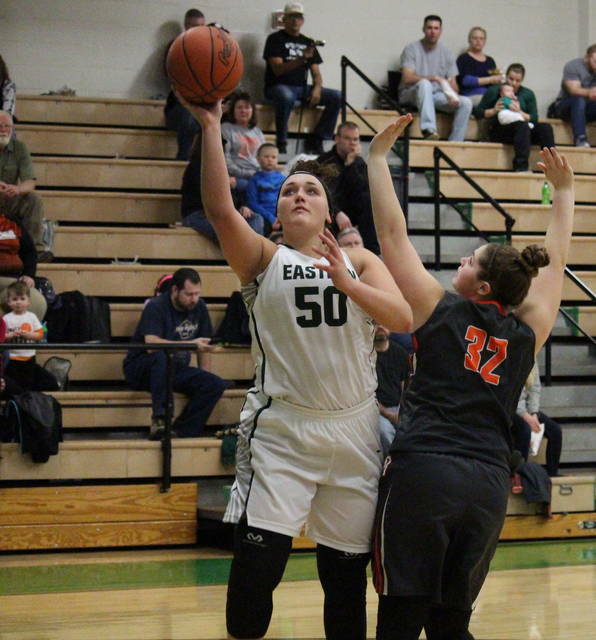 Collins averaged a double-double of 15 points and 10 rebounds her senior season at EHS, after averaging 10 points per game and a junior and 5.5 points per game as a sophomore. A three-time All-Tri-Valley Conference Hocking Division selection, and a two-time All-Ohio honorable mention, Collins was an All-Southeast District selection all-4 years. Elizabeth was an all-district special mention as a freshman, a third teamer as a sophomore and a second teamer in both her junior and senior seasons. Collins credits her coaches and working in the gym every day, as well as playing travel ball as to what helped her get to the next level. Siena Heights University is located in Arcadia, Michigan, 36 miles northwest of Toledo, Ohio. SHU is an NAIA school and the Saints compete in the Wolverine-Hoosier Athletic Conference. Collins will be joining a Saints squad that was 18-13 last season, including 11-9 in the WHAC. In her 12th season as head coach of Siena Heights is Sue Syljebeck. Collins — who held a 3.7 grade-point-average at Eastern — will have a Pre-Veterinary major at SHU.